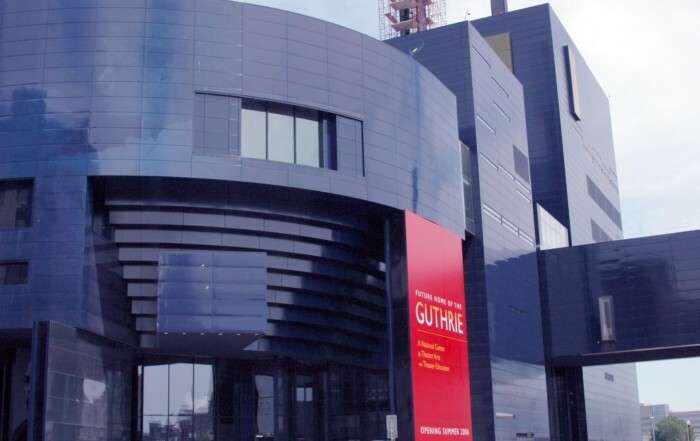 Regarded as American’s flagship theater, the Guthrie Theater has consistently maintained its mission of artistic excellence since 1963. After outgrowing its former facility, the Theater needed to expand. Because its current space was geographically limited, the Theater decided to construct a new 285,000 square foot theater on a brownfield site along the Minneapolis riverfront. We assisted in evaluating the suitability of the proposed site. Geotechnical design obstacles included constructing the building over a 60-foot tunnel used to connect existing and former grain elevators. The foundation system also needed to resist the overturning forces of the “Endless Bridge,” the 170-foot long cantilevered walkway that extends toward the Mississippi River and hangs above West River Road, without causing unacceptable deflection or cracking during construction. The foundation chosen consisted of two large footings 23 feet wide, 80 feet long and 10 feet thick. Each footing contained two layers of reinforcing steel and was set on Platteville limestone, which provided a rigid foundation. The theater design utilized a wide variety of materials, including drilled shaft and spread footings, masonry walls with special acoustical barriers, poured concrete walls, floors consisting of post-tensioned decks, metal decks and waffle slabs, and structural steel framing. To help prevent damaging vibrations to adjacent historic and sensitive structures, we performed vibration monitoring. Environmental challenges included identifying, segregating and managing clinker-impacted fill soils. Permitting and coordination with many different state, county and city agencies was required.